​Winter is here, but Spring is coming! Time to clear out the Christmas clutter and clean out those closets and toy boxes! And it’s time to turn your child’s outgrown clothing, toys, books, baby gear, bikes, games, etc. into cash! Instead of sitting outside for hours on end at a garage sale, or listing individual items on Facebook garage sale sites, only to get stood up by the buyer in the middle of a parking lot, sell your items at Twice Blessed! 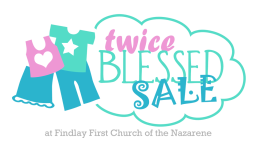 Hundreds of people come to our sale for the chance to buy nice, clean, quality children’s items at bargain prices, so come be a part of Twice Blessed! Our Twice Blessed Team is already busy planning for our Spring 2017 Children’s Sale! This will take place on Thursday, April 27 – Saturday, April 29. We had a record number of sellers at our Fall sale, and numbers are limited on the amount of consignors we can accommodate, so mark your calendars now for seller registration! Online registration will open on Monday, February 27 for returning sellers, so be sure to grab your spot then! If you’re interested in being a new seller with us, you’ll have the chance to register on Monday, March 13. Seller registrations are on our website at www.twiceblessedsale.org. We also can’t help but tell people about the wonderful benefits of volunteering! Twice Blessed loves our volunteers and takes great care of them! We offer free meals at every shift, free childcare (numbers are limited and you must request this in advance), and the best part of all is the Volunteer PreBuy! As a volunteer you’ll get to come shop the sale before it even opens to the public! This means you’ll get the first pick of the best items at the best prices! And, you get to shop in a relaxed shopping environment reserved only for Twice Blessed volunteers! We have a huge range of volunteers from all over our community, so invite a friend to sign up with you and come help us out! We have a large variety of jobs available and can find a task and time to fit you and your schedule! Volunteer sign ups are accessed through our website at www.twiceblessedsale.org. For specific sale hours, or to learn the details about being a Twice Blessed seller or volunteer, check out our website www.twiceblessedsale.org or Facebook page. We can’t wait to see all of our amazing sellers, customers, and volunteers in April! Hi Twice-Blessed Sale friends! I can't believe our 20th sale is finally underway! We have almost 15,000 items from 113 Consignors! Come check us out today through Saturday. Here's a special announcement Eric made made at Findlay First Church of the Nazarene last Sunday. Have a twice-blessed week! 20th Twice-Blessed Sale Announced - Sunday, Sept 18, 2016 from Nate Stults on Vimeo. Hi Friends, Shoppers, and Consignors - We are so glad to be hosting the Twice-Blessed Sale again this year. Check out our announcement at church that a few of our biggest supporters put together! See you at the sale! Twice-Blessed Sale Announcement - Sept 2014 from Nate Stults on Vimeo.